The Kamel Youssef Jaber Cultural and Social Center is a charitable foundation founded in 1996 by the late Kamel Youssef Jaber as a not-for-profit organization. It officially opened its doors in July 1998, and has since been running under the supervision of Mr. Yassine Jaber MP, supporting a wide range of cultural and social activities. We wish to aid in the cultural and social development of the Nabatieh region, and to assist its people in furthering themselves, and their knowledge, and hobbies in the fields of their choice. In 1999 The Center started offering classes in Computer Skills and English Language. The response to these classes was overwhelming. The number of applicants within 48 hrs of announcing these programs exceeded 1500. Since then the number of students who have attended these classes that have been running continuously, has well exceed ten thousand students. In addition to the courses mentioned above The Center has been offering fast vocational training classes, in various fields such as secretarial training, marketing, cosmetology, hairdressing and computer maintenance. Since The Center started to operate, it has focused on children and teenagers, offering them various creative activities such as folk dancing, theater, choir singing, ballet, and painting. A folk dance group and a chorus were formed in the center, and made presentations on the Center’s stage during various home events, they also participated in many festivals and folk dance shows on national level. A theater club was also formed, and youngsters learned how to act, and took part in the center, and in villages around Nabatieh. The art classes (painting) revealed many young talents, and for the past four years the center has been holding an annual art exhibition at the end of summer, where these young artists, exhibit their paintings. This exhibition has become a very popular event in the region of Nabatieh. Some of our young artists were sent by the Center to other Arab countries, to join regional exhibitions. Some of them came back with distinguished awards. 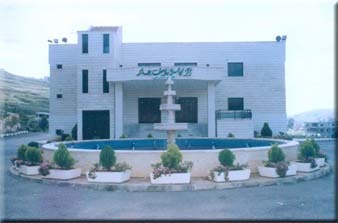 Through the Nabatieh Shabab Center, which the Center started in co-ordination with the association for supporting Public Schools in Nabatieh region, young students from Public Schools have the chance to join various clubs such as social, media, internet painting, music, theater, folk dance, cinema, photography environment, table tennis, basketball, volleyball and gymnastics. These clubs are offered as extra curricular activities, twice a week after classes, and help kids develop their different talents, and help to promote democracy in action through activities that address the challenges facing the Mouhafathat el-Nabatieh Community. The core of the program is rooted in a structured methodology of collaborative projects that are based on democratic principles, and advanced communication techniques. The number of children and teenagers who have joined this program exceeds 1200 children each term. All year round The Center offers to its audience of kids, and especially Public Schools students various types of entertainment, including plays, shows, and musicals. The peak of these activities is in summer where the child’s cultural festival takes place. It usually gathers more than one thousand children of all ages, where they take part in sport activities, computer games, internet club, talent activities, trips, and watch a series of entertaining shows. To be able to reach children in various communities, the Center, in co-operation with local NGO’s, has sponsored children’s events and camps, in several villages in Nabatieh, Marjeyoun, and Hasbaya. This co-operation and outreach has proved very useful in encouraging children and youth to know each other, and in promoting the principal of national unity. The Center has held in the past few years special educational support sessions for under performing students. The center helps through these special sessions those students, who come from different public schools in Nabatieh Caza, to improve their academic performance. The center also offers special sessions for helping under performing students prepare to sit for official exams. The number of students who attend such sessions every year is over 500 students. In addition, the center has been offering special programs, dealing with illiteracy, and child labor. The center also manages the children municipalities program which also aims to promote democracy through the process of students each year electing their representatives working together to achieve aims that they collectively chose. The center has not forgotten the elderly, especially widows, and two day trips have been organized, twice a month on a regular bases. The trip usually includes full bool stay at 3 star hotel, and sight seeing. These trips have proven to be very popular because they allow those who are usually forgotten at home, to change the environment they are living in, and come back with a new spirit. Other social activities include providing food rations several times a year to the poor and needy, especially widows at home and homes with orphans, in the city of Nabatieh and villages in the Caza of Nabatieh. Among the facilities available at the center is a public library that is a partner of the Ministry of Culture, and the only one in the city of Nabatieh. Within the library an internet station is operated under the pipop program in partnership with PCA. Both the library and the internet station are open to the public free of charge. The center is located in the center of the city of Nabatieh. Its facilities comprise a multipurpose hall with a theater fully air-conditioned, exhibition hall, teaching rooms, offices, a library, two computer labs, sports field, gardens, special art section, and a number of guest suites should the need arise. All the activities, classes, workshops, shows training sessions, facilities, are offered free o f charge, with the Jaber foundation headed by Mr. Yassine Jaber covering all costs and expenses.